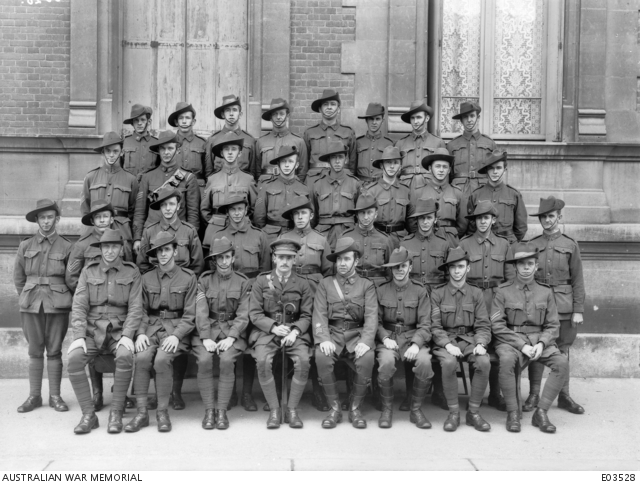 Group portrait of the Staff of A Subsection (1st Division) Australian Base Records Section, of the 3rd Echelon. Left to right, back row: 566 Staff Sergeant (S Sgt) A. E. Harvey; 2574 S Sgt C. J. Baldey; 1836 S Sgt R. Swinbourne; 869 S Sgt S. Greenwood; 750 Lance Sergeant E. Wreford; 4239 S Sgt D. C. Menzies MSM; 3067 S Sgt L. R. Overhue; 1183 S Sgt P. H. Paul. Third row: 154 S Sgt E. E. Fletcher; 643 S Sgt S. G. Slater; 1957 S Sgt K. L. Brockett; 3807 S Sgt S. Johnstone; 3810 Private (Pte) J. Brookes; 504 S Sgt P. C. Dale; 1404 S Sgt W. McIntosh; 5746 Sergeant (Sgt) E. Peace, Orderly Room Sergeant. Second row: 6587 Corporal (Cpl) V. E. Vokes; 42 S Sgt A. Hamilton; 5029 Sgt E. E. A. Matthews; 1485 S Sgt S. M. Channon; 1001 S Sgt L. P. Wayling; 211 S Sgt C. G. Jackson; 575 S Sgt W. J. Hayes; 1704 S Sgt R. Weatherall; 207 Sgt H. S. L. Ogden. Front row: 5227 Cpl P. McMurray; 2550 Pte C. C. Marshman; 3302 Sgt A. B. Cousins, Orderly Room Sergeant; Captain D. R. Crooks; 114 Warrant Officer Class 1 R. Hodgkin; 1212 Cpl D. W. Pegg; 3797 Cpl G. W. Eyre. France: Haute-Normandie, Seine Maritime, Rouen. 1918.